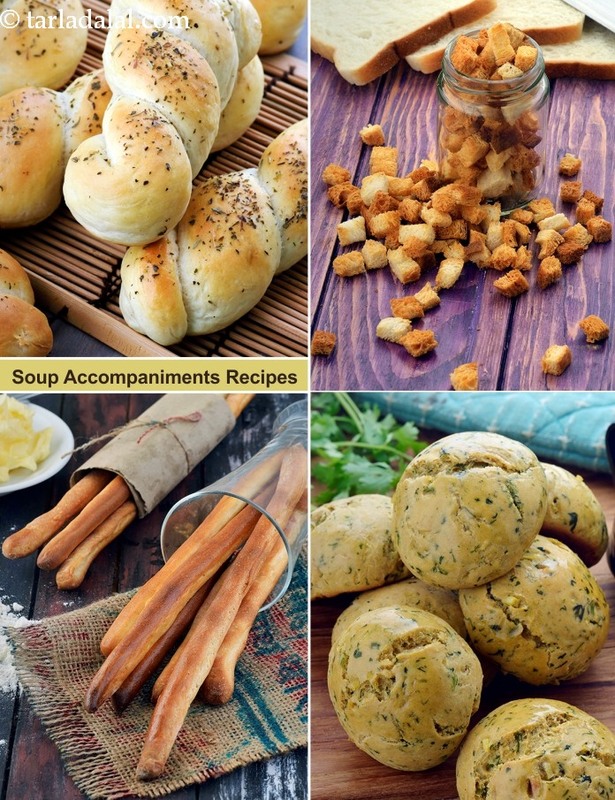 Soup Accompaniments – Accompaniments served with soup delight the diner just as a surprise gift delights a kid! Small chunks of crisped bread or fried noodles, which can be used to garnish the soup, or larger treats like herbed bread sticks, which you can dip-and-munch, add to the ‘kick’ factor and make soups more interesting. With accompaniments like Cheese Croutons and Garlic Croutons, a bowl of soup transforms into an exotic and memorable experience! Here is a spicy and crunchy version of the all-time favourite bread croutons, which are served with soups and salads all over the world! We have deep-fried the croutons and tossed them in butter along with garlic and chilli powder. This gives the Crunchy Garlic Croutons a buttery and spicy taste, which is so amazing that you will be tempted to have them as a standalone snack even without Soups, Pastas or Salads! Soft butter is mixed with fresh herbs like dill. Garlic and lemon juice is added too, giving it a tangy delicious flavour. A great accompaniment on the soup and salad table! Simple way to spruce up your normal butter by adding parsley and garlic. Other herbs can also be used. Brown bread rolls are definitely a healthier version of the maida bread based roll recipe. The vegetable stuffed brown bread rolls are fried and then enjoyed as snack with chilli sauce or chutney. Its actually the soup breads which we usually consume with thin/thick soups. Its very tasty and easy to make. It can be baked either in oven or microwave oven. I would recommend you all to make and try this recipe at home.